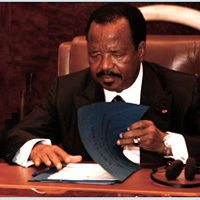 The government of Cameroon ratified the African Youth Charter on 11 January 2011 when the country's Head of State for 28 years (see photo) signed Degree No. 2011/002 in the nation's capital, Yaounde. This is a commendable move in the right direction - which goes to show that the 28-year-old regime acknowledges the need to promote and respect human rights and basic freedoms. But given the present sorry-state of human rights in the west-central African country, the ratification of the African Youth Charter appears to be cosmetic. The African Youth Charter is a human rights instrument designed to protect the rights of youths in the continent. It lays down the rights, freedoms and duties of youths, as well as States Parties' obligations. The Charter was adopted in Gambia in July 2006 by the African Union and it is open to ratification by member states of the Union. A good number of Cameroonian youths are unaware of the existence of this Charter - despite the fact that Article 27 obligates States Parties to popularize the Charter - and many do not enjoy the basic rights and freedoms laid down in the Charter. For instance, the right to freedom of expression and association as laid down in Article 4 and 5 respectively are not guaranteed in Cameroon. Only 12 days after the Head of State signed the Degree that ratified the African Youth Charter, security forces brutally cracked down on youths peacefully calling for democracy and human rights in Cameroon. Ratification of the African Youth Charter by the government of Cameroon is good news for youths and rights advocates, but the government should do more than ratify international human rights standards. Implementation is much more important. The state should respect its obligations under international law and restore basic rights for youths. African youths are encouraged to promote and demand the rights and freedoms laid down in the African Youth Charter.